Nutleys Kitchen Gardens was set up in 2008 by grow-your-own enthusiast Jo Nutley. The site is built using the Magneto Ecommerce platform - chosen because of its ability to integrate with their in-house sales and inventory systems. The design was developed in conjunction with our design partner Lisa from Stoats and Weasels. The Magento ecommerce platform is well respected and is probably one of the most recognised brands in the 'shopping cart' arena. The Nutley's site was built using Magento's Community Edition (CE) which is open source. Using the design templates and configuring the 'ton of features' available from Magento we have built an online store for this successful retail chain. The design was developed in conjunction with our design partner Lisa from Stoats and Weasels. The Magento ecommerce platform is well respected and is probably one of the most recognised brands in the 'shopping cart' arena. 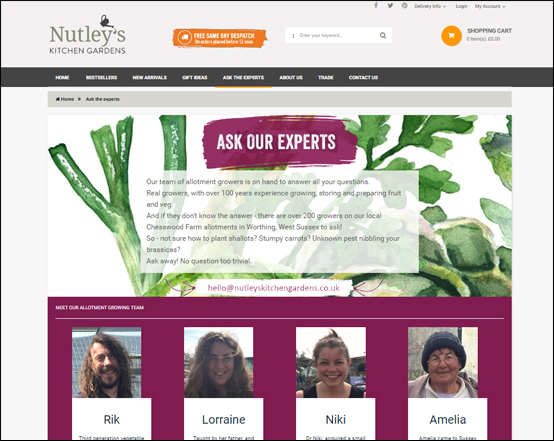 The Nutley's site was built using Magento's Community Edition (CE) which is open source. Using the design templates and configuring the 'ton of features' available from Magento we have built an online store for this successful retail chain.